Mosey into the Wild West, circa 1888 after finding Grandpa Willy's old cowboy gear in an attic. 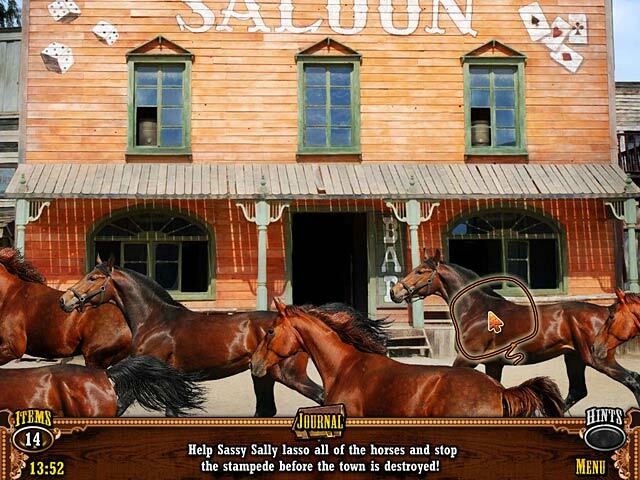 Transported in time, you'll scour gold mines, stagecoaches, and saloons in search of hidden objects. Be light on your feet as a gang of banditos is hot on the trail of your Grandpa Willy. 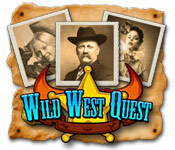 After sleuthing 36 Wild West locations, the prospect of gold is near in Wild West Quest. Wild West Quest: Gold Rush is rated 3.5 out of 5 by 12. Rated 5 out of 5 by Pollysweet from Once again, a great little game This is a great game from the Anarchist people. I have other games of theirs. This game, like the others, involves no blog walk through, nothing to consult. All you have to do is find things and solve fun puzzles. And, it can be played over and over again which is a huge plus for me. Rated 5 out of 5 by sushifiend3 from We had alot of fun! I did not know if I would like this game if I downloaded it.I gave it a try anyway.I just love westerns.I started playing and next thing I knew,my 7 yr.old was playing the game with me.He said he loved it alot.We got lost with the 1 hour because we were dancing in our chairs,we enjoyed this game ,music and everything about it.Thanks for this one and for my son being able to have fun as well. Rated 4 out of 5 by Montana_Peach from Still one of my favorites I bought this game years ago and find that I still come back to it to play quite often. It's not complicated with a long twisted storyline, though the story is interesting. It's purely a fun, relaxing game with a few novel scenes - such as the shooting gallery. Rated 4 out of 5 by planetankh from 4-Star Kids Game Probably not challenging enough for adult gamers but a great game for children & pre-teens. No morbidity, no gore, no gloom, nothing scary. Pretty much a basic, fun hidden object game. Recommend for kids. Rated 4 out of 5 by LDWRN2002 from Fun but too short I enjoyed everything about this game but was disappointed it was so short. Have played it all the way through a few times in one sitting. It is fun for adults but I agree it would be good with kids too. Especially helpful with hand and eye coordination during the moving scenes. Rated 4 out of 5 by rethabalcom from Fast moving Liked that the items we at a perfect level to keep moving. Then the action games, you do have to move faster. Would be good for a 8-10 boy also. Rated 4 out of 5 by mscott57 from great game was a lot of fun, and did not lose interest. Rated 3 out of 5 by bigCharley from ok, but the creators/proofers probably should do a better job of labeling the objects. A top hat is NOT a derby hat, for example. this is frustrating when one is looking for one thing and finds that it is called another. Another example: "decorative cup" turns out to be a wine glass looking piece of glassware. 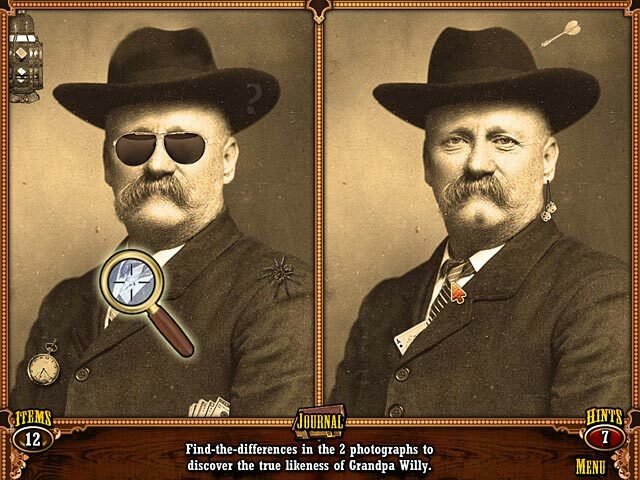 also, the "find the difference" game sometimes is a little bit ridiculous...for example one end of a mustache being a bit different. Even when I used one of my hints, I couldn't tell the difference. Other than this...average game, but frustrating to me at times because of the above examples. 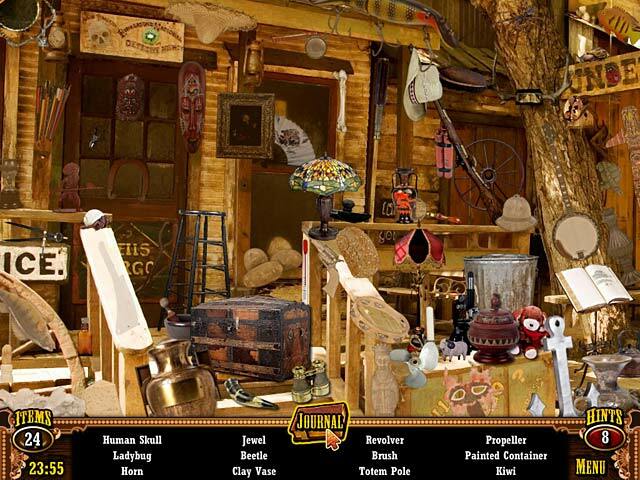 Rated 3 out of 5 by FinnyFine from Very short, Hidden objects and variations only. I'm not usually one to finish games very fast, but I was able to finish this one in the trial hour without using hints. It is a very standard HOG. There are no complex puzzles, just variations on the HO theme, such as finding small sections of a larger picture, finding one type of object (gold nuggets for example), and picking out the bad guys in a non timed, non penalized "shoot out". It's pleasant and well worth checking out on the trial, but in my opinion, it is just too short to justify purchase. Rated 3 out of 5 by yorkie_1 from Newbe This was fun. I enjoyed this game because it test your eye site. Nice it was fun and you can just enjoy finding things, the side puzzles fun also..